There are over 1 Billion Social media users worldwide and these people engage and produce contents on social media. With so much content out there being produced by others, doesn’t it make sense to curate such contents and provide your audience with rich and high quality contents? As bloggers we can leverage social media contents in creating better contents for our sites. No matter the niche you are in, there are millions of contents created every day and you can leverage them to providing your audience with better content. You don’t always have to create content, learn to share quality contents produced by others and keep your audience engaged and satisfied with rich contents. Now the question one may ask is how exactly can we leverage social media content in creating better contents for our website/blogs? Social media sites like Facebook, Twitter, Google+, Pinterest etc have all recognized the importance of content distribution and have all created a way for webmasters to embed posts on their websites. Embedded posts will not only improve the number of followers but can also bring good exposure to your profile pages from your site or blog. Embedding Social media posts on your blog will add interactivity and improve your site engagement which will in turn lower your bounce rate and improve your search engine ranking. Embedding social media posts on your blog can help your audience interact with the post right from within your blog. Your audience can “Like” the embedded post, Share or even Comment on the embedded post right from within your blog post where you embedded such post. You can also improve your profile page followership from embedding your social media posts on your blog. But most importantly this post is concerned about how you can create better contents for your site with Social media embedded posts. So let’s see how you can embed posts from the various social networks on your blog. 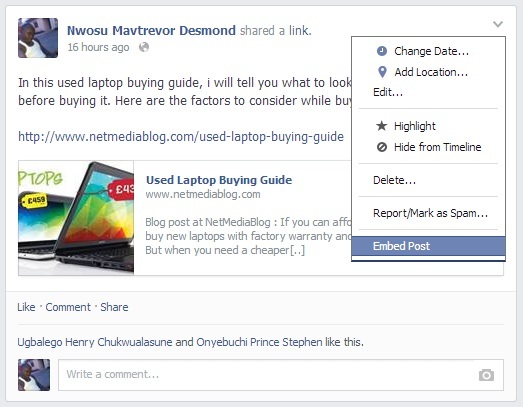 Click on the option menu of any Facebook post you want to embed on your blog and select “Embed Post” from the drop down menu options. 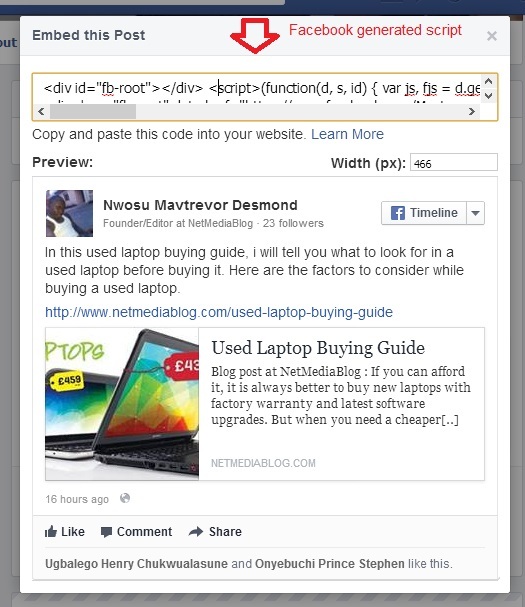 Then Facebook will generate a script for you, copy the generated code into the part of your website/blog where you want the embedded post to display and publish. Login to your Twitter account and select the post you want to embed on your site, click the “More” and select embed Tweet. 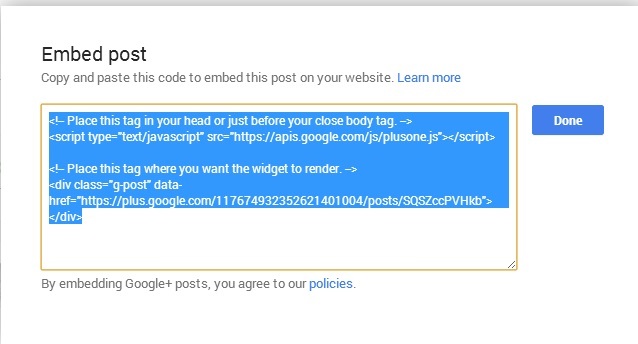 Then a code will be generated for you just like that of Facebook above, copy the code and post it on any portion of your site you want to display the embedded post and publish. 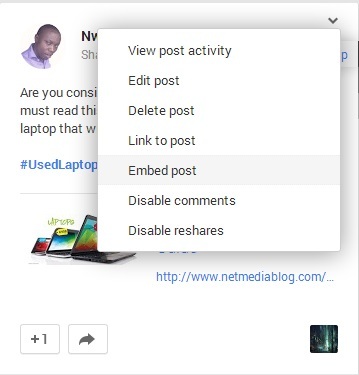 Sign in to your Google+ account and select the post you want to embed on your blog, click on the Option menu and select the “Embed” option. Then Google+ will generate a code for you, copy the code and place it on your blog/website to embed the post on your site. Sign in to your Pinterest account and select the pin you want to embed on your blog, click on the Option menu and select the “< > Your Website” option. Then Pinterest will generate a code for you, copy the code and place it on your blog/website to embed the pin on your site. Then choose Pin Widget from the widget builder options and click on the built it button to generate the code. Copy the code to your site to embed the Pin on your site. Now that you can embed post from several social media sites, you can leverage on it to add different types of media to your content and this can greatly improve the quality of content you share on your site. Your audience will be pleased to find a variety of content curated in one instead of searching the whole internet for solutions. What do you think of this topic “Creating better contents with Social Media Embedded posts”? Let me your your views and how you think content creators, webmasters and bloggers can leverage contents produced and shared on the social networks to creating better contents for their website. Remember to subscribe to my blog. Thank you for this post .. its really cool idea to give weightage to our post on blog its add value to our content and support. Thanks for this article, Nwosu. This is no doubt a very helpful article for those who have always wondered how content can be embedded from social media. Now they can learn exactly how to. First, the idea of embedding content from social media onto your site is a good one. Since there’s only so much content you can write on your own, it’s good to provide your readers with more content related to what your blog is about. Thankfully loads of such content get added/shared on social media every minute. I like how you really explained how embedding can be done. You included the the right screenshots and steps to make it super easy for anyone to follow and achieve the desired results. Even those who seem to always have problems with technical instructions shouldn’t have problems with this. One question though – what do you have to say to those who might be afraid of losing traffic because of this? Is that fear valid? There is no fear of losing traffic if you have the interest of your audience at heart, a visitor who finds quality contents on your site will always return to look for more. So i dont see how you can lose traffic from it. That’s really wonderful post, I check embedded feature at facebook many time but didn’t know it’s purpose. Now I get the exact working of it. 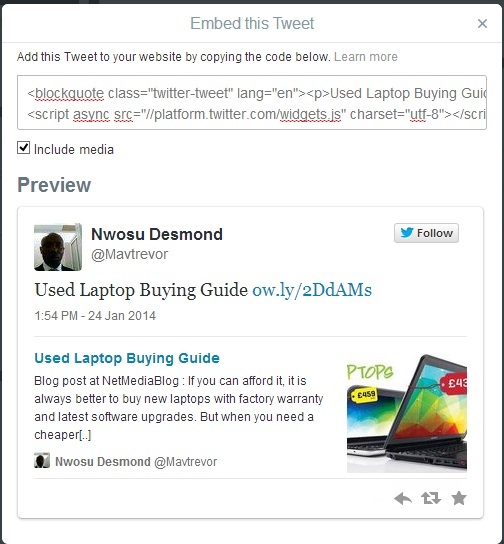 Will surely use embedded social post at my blog. We can create an interactive blog whenever we embed social media post on our blog and it can leverage the engagement and better search engine ranking so I agree with your thought. And by doing so, the social media accounts that is connected with your blog can be followed easily since it is visible. “kingged” it and left this comment. Embedding contents on a website from social media is always difficult for many people. However, with the explanations from this post,there is no doubt that the process is practical. A good share Desmond. I learned new things from it! Thanks Metz for your awesome contribution. Do have a great week. Glad you found this post interesting and useful. Thanks for leaving a comment.